Basically everything in a post can define its overall value. You can pay a fixed fee, add something depending on the number of words, maybe some more for visits, and then take care of images and comments as well. 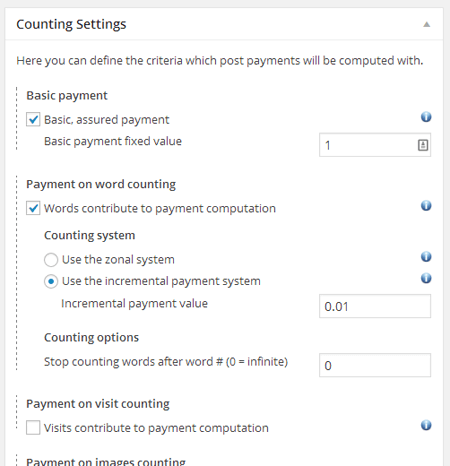 You can set a limit on the maximum number of each counting category and a total payment too. Every time there is a number of something to be paid (a number of words, a number of visits…) you can choose whether you want to use an incremental system (e.g. each word is worth $0.01 => 100 words are worth $1.00) or a zonal one (e.g. between 100 and 200 words pay $1.20 => 190 words are worth $1.20) with as many zones you want. 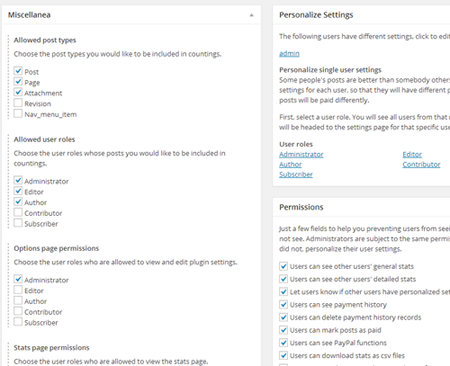 Include or exclude posts from stats depending on their post type (the plugin works with custom post types, yeah! ), the author user’s role and its post status (published, future, pending). General stats display all users in the same page, showing how much each of them should be paid basing on the number and value of their posts. 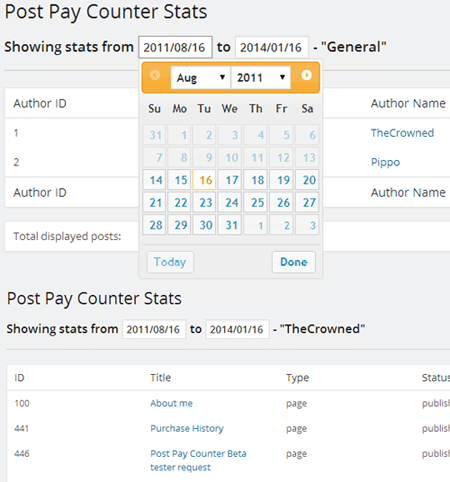 Detailed stats display an in-depth view for an author. You will see how the total amount has been calculated, with details for each post (number of words, visits, images and comments). 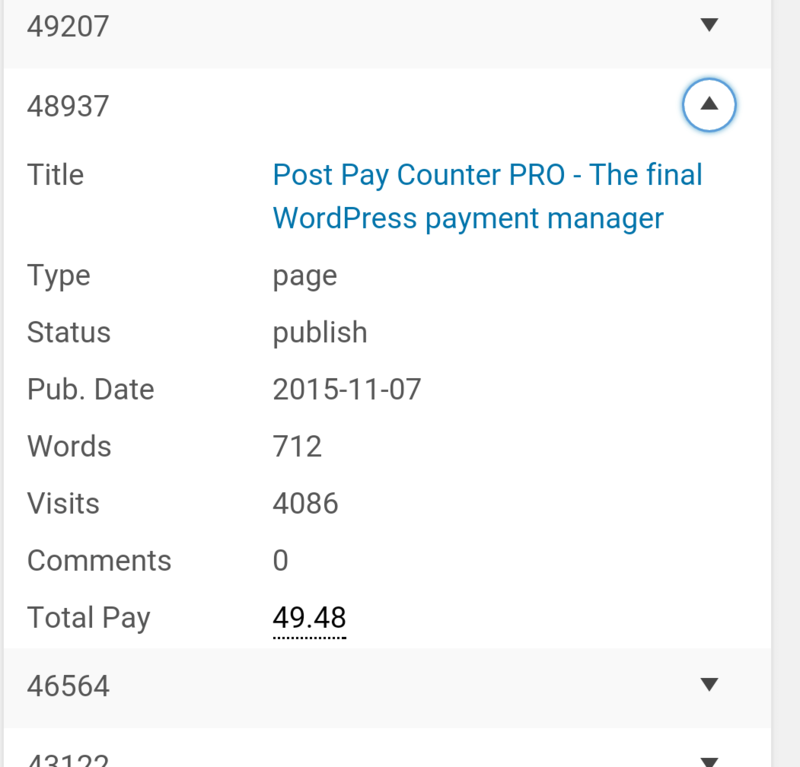 View posts calculations since the first written post, regardless of the plugin install date. A fancy date picker lets you shift between days and select the desired time range. Fond of stats and numbers? At the bottom of regular stats an overall stats box displays your all-time overall stats, from the first post ever to the latest one. Want users to be able to see only their own stats and not other users’ ones? Yes you can! There is a whole set of permission settings to define what users should and should not see. Some users may deserve more or less than others: they can have custom settings for what concerns payments and permissions. Exporting and importing settings makes duplicating settings easy! You can copy them from a user to another or even across different websites. There are several addons that further extend the plugin features: integrate with Analytics, Adsense and PayPal, reward proof-readers, pay per Facebook shares and likes and so much more! Being fully integrated into WordPress, Post Pay Counter can fully be used from smartphones and mobile devices. The stats table will scale and collapse its data accordingly for a smooth experience! The plugin is available in English, Italian, French, German, Dutch, Portuguese, Czech, Turkish.